What happened to those 11 years of the Tour de France? If you are a fan of the Tour de France, chances are you know the great bike race began in the year 1903. 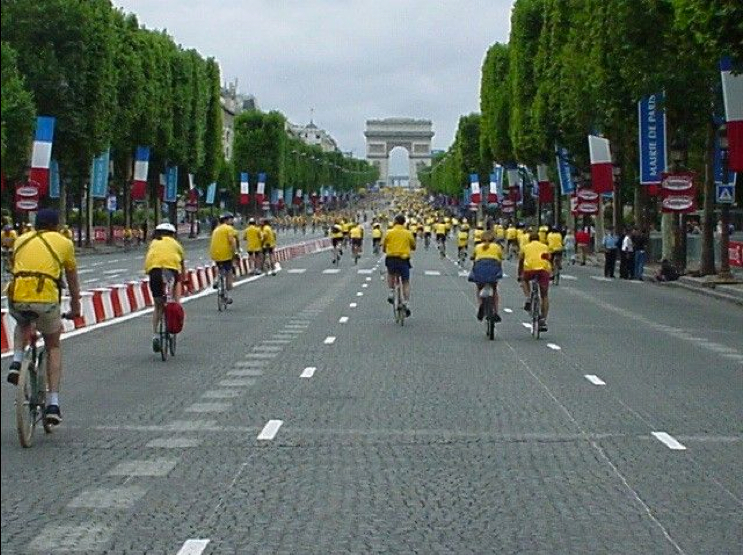 In 2003 the celebration for 100 years of the Tour de France took place. But this is 2013 - how is it that we are finally celebrating THE 100th Tour de France? War - that horrible thing that changes lives. World Wars took 11 years of life from the grandest of the Grand Tours - the Tour de France. Philippe Thys - winner of the Tour de France in 1914 before the race ceased for 4 years during WWI. 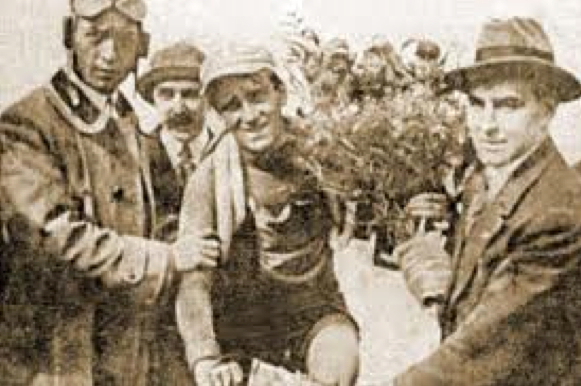 In 1914 Belgian cyclist Philippe Thys won the 5,405 kilometres (3,359 mi) Tour de France. One week after the 15 stage, 28 day race of the 1914 Tour de France, Germany invaded Belgium and declared war on France. 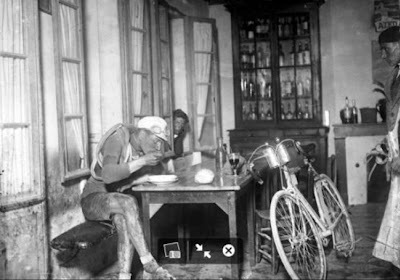 Five years would pass and over 5 million soldiers would loose their lives, including 3 previous tour winners, until the Tour de France would emerge again in 1919 when another Belgian cyclist, Firmin Lambot, won in a field of only 11 total finishers. 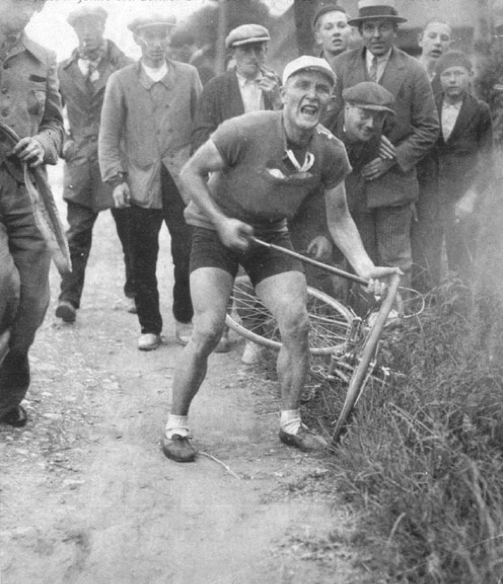 Firmin Labot - winner of the Tour de France in 1919 when the race resumed after the war years. From 1919 to 1939 the race was on for twenty years. Sylvère Maes - winner of the Tour de France in 1939 before the race ceased for 7 years during WWII. In 1939, again World War was declared within a month after an already poorly attended Tour de France was won by Belgian Sylvère Maes before a 7 year gap ensued. WWII would rage from 1939-1945 claiming over 60-million lives. The French newspaper l'Auto, organizer of the Tour pre-war, refused to continue during occupation and eventually closed after the war under great controversy. Famed Tour organizer Henri Desgrange died during the war, in 1940. After the war it took two years until the newspaper L'Equipe, now reformed and led by Jacques Goddet, took a solid hold on rebuilding the Tour de France post-war. To Goddet the paper and the race where close to a family affair, his father had worked for the original l'Auto. 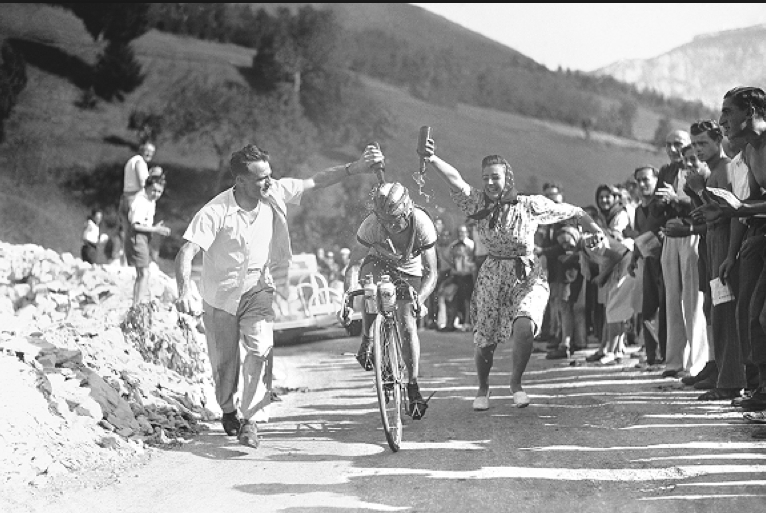 Jean Robic - winner of the Tour de France in 1947 when the race resumed after the war years. The Tour resurfaced in 1947, with Frenchman Jean Robic winning the Tour in a year when riders represented eight countries, with just over half finishing the race. The Tour de France was back. Since that time, many heroes and characters have graced the race including: Fausto Copi, Loison Bobet, Charly Gaul, Jacques Anquetil, Eddy Merckx, Bernard Hinault, Laurent Fignon, and Miguel Indurain. Read more about the full history, year by year, of the Tour de France at this website: Chairman Bill's History of the Tour de France. 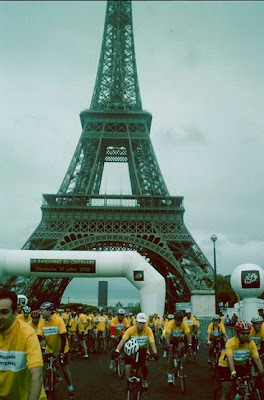 It seems strange to look back and realize that I spent my vacation time in France in 2001, 2003, and 2005, chasing and cheering on the now fallen winner of the Tour de France - Lance Armstrong. I was in Paris three times to witness Lance Armstrong step onto that podium and with pure cockiness and deceit accept an award that he absolutely did not earn. He cheated every rider and fan who supported the race during the erased years and should forever be banned from cycling. The erased years are a sad dent in the armor that only war had previously touched. In 2003, I was super fortunate to be able to attend and ride in La Randonnee du Centenaire, a celebration of 100 years of the Tour de France. Thousands of citizens, grabbing anything with 2 wheels, rode the course around the closed streets of Paris. It was thrilling. A day at La Randonnee du Centenaire in Paris, 2003. 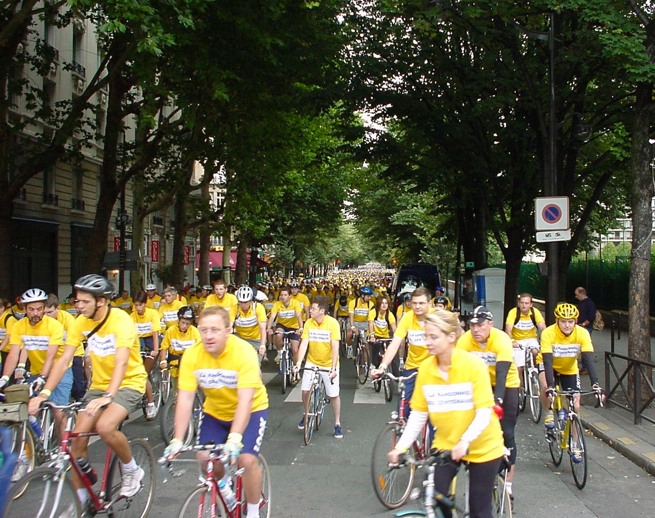 Rolling along to streets ready to take our place to begin the organized La Randonnee du Centenaire in 2003.